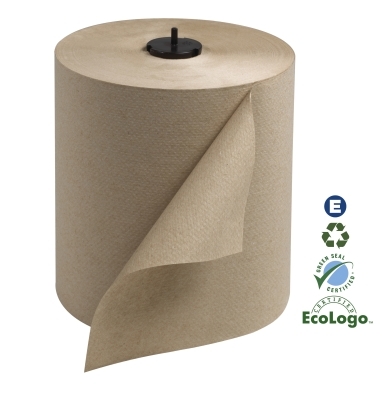 290088 Tork Natural, brown roll towel 6/700 50/sk - Sierra Supply & Packaging, Inc.
Soft, strong, and highly absorbent, this towel offers the perfect combination of quality, performance, and value. Embossing enhances hand feel and maximum absorbency; fewer towels are used per hand dry. Less packaging means source reduction, reducing your overall labor and maintenance costs. Long lasting rolls minimize maintenance costs while maximizing service. Towels are made from 100% recycled fiber provides environmental benefits. A positive image builder. EcoLogo® Certified.